The Magic influence on Dominion is clear, especially given the designer's history. Donald X. Vaccarino is a San Francisco programmer from way back; in 1986 he coded Reactive Micro's Voice Harp Composer for the C64, Atari 800 and Apple II, and he wrote scripts for a 2001 fan-created Heroes of Might & Magic III add-on, Wake of the Gods. Vaccarino had played few hobby games - "designer games," "German-style games," what have you - before he discovered Magic in 1994. "I had designed a few games, but it was just something I did once in a while without really thinking it through," he told Eric Martin of Boardgame News in an interview last October. But Magic inspired him. Vaccarino designed an unofficial 90-card Magic expansion set, Edge of the World, which was distributed as prize stickers at the 1996 ManaFest gaming convention in Southern California. He also visited publisher Wizards of the Coast annually to demo his new game designs for Magic designer Richard Garfield, and he worked informally with the in-house Magic R&D team, earning a credit for his work in the Comprehensive Magic Rulebook. Two years after creating the game, Vaccarino estimates that he's played it about 1,000 times, with those games spread across any number of card configurations. "Most of those games have involved expansions. With the main set you may eventually feel like you've made all the decks; once you have an expansion or two, you will never see everything." Yes, of course there are expansions - and not a moment too soon. Obsessed game groups took most of a year to hit bottom on the original game, and some of them, like lovers past their first infatuation, started to nitpick. 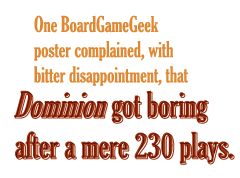 Gameshark faulted Dominion for being "overbalanced, overdesigned and overdeveloped" - buddy, we should all have such problems - and one BoardGameGeek poster complained, with bitter disappointment, that Dominion got boring after a mere 230 plays. In June 2009, just as game groups were looking around blearily and saying, "Hey, didn't we used to play other games?" the standalone expansion Intrigue arrived to overrun them again.